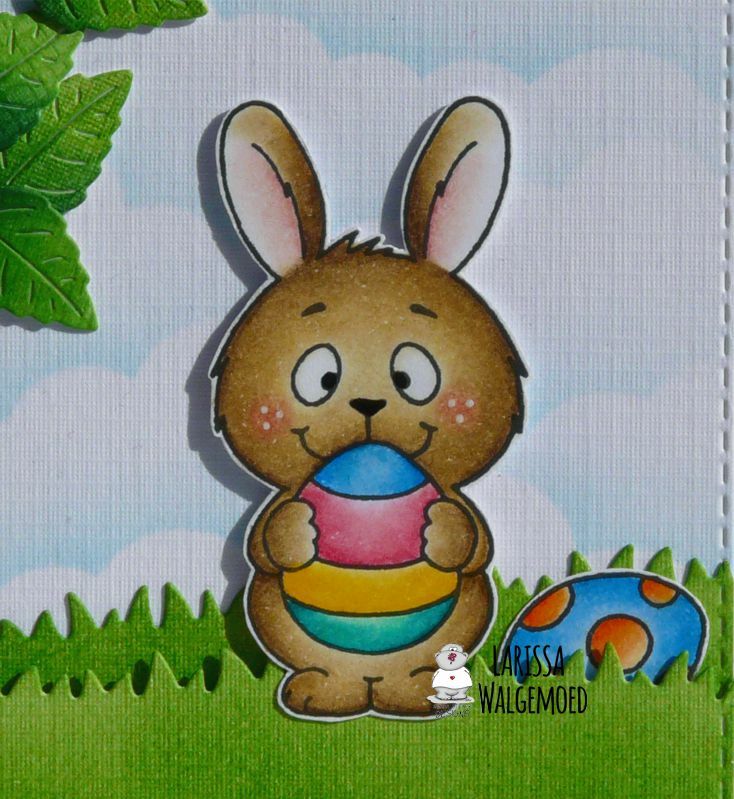 This time I made a card with the stampset Easter bunnies from Gerda Steiner designs. I have coloured the bunny with my Polychromos pencils, the black glaze pen and a white gelpen. I also stamped a couple of eggs and coloured those also with my pencils. I have fussy cut all the images. With the Crea-nest-lies XXL 34 from Crealies I have die-cut a square from white linen cardstock and I made a background on it with the Mini cloud edges stencil from My favorite things and Tumbled glass distress ink. I have die-cut 2 grass hills with the Grassy hills die-namics from My favorite things and I coloured them with Mowed lawn distress ink. I have die-cut a tree from white cardstock with a Tree die from Action and I coloured it with Vintage photo distress ink. I have die-cut a couple of leaves with the Leaves mix 115633/ 0238 from Craft emotions and those are coloured with Mowed lawn and Pine needles Distress ink. I have glued the leaves on the card with some foamtape. Then I glued the bunny and all the eggs on the card with foamtape. I have stamped a sentiment from the set Easter bunnies from Gerda Steiner designs on the card.